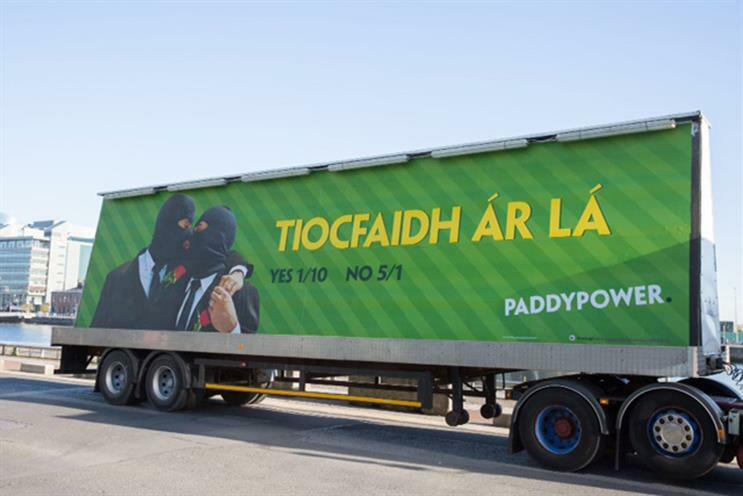 Paddy Power, the bookmaker, has launched a tongue-in-cheek campaign to promote its odds on the outcome of Ireland's gay marriage referendum. The campaign, featuring a balaclava-clad newlywed male couple, launched in Dublin yesterday (27 April) and was produced by BMB. It features the headline "Tiocfaidh Ár Lá", which translates as "Our day will come". The phrase is associated with Irish republicans and often used to express their belief that, one day, Ireland will be unified. Paddy Power says the "Yes" vote is likely to win in next month’s Marriage Equality Rerendum. It is giving odds of 1/10 for a Yes win and 5/1 for a No win. A Paddy Power spokesman said: "Our latest betting on the referendum makes it look rosy in the garden for the Yes camp but don’t be surprised if the No vote comes from behind to give us all a surprise. In the words of Sir Alex Ferguson, it’s squeaky bum time." The work was created by Trevor Beattie, BMB's co-founder, and was designed by Dan Forde. BMB was founded by former TBWA executives Trevor Beattie, Andrew McGuinness and Bill Bungay in 2005.